Dear Reader: It's been two new saints, yet another 7 daily poems, another drop into the cooler regions of the thermometer and a week since my last confession. It's been rainy the last few days here and tonight it's not only yucky wet but cold as well. I've heard our temperatures are anticipated to drop somewhere between 37 and 41 for the low tonight. I confess that is not the picture I envision goes with the green that is popping up all over and the Tulips and Iris buds, etc. If this cooler then normal weather is not bad enough, the crop of deadly twisters cropping up in Iowa, Oklahoma, Tennessee, Alabama and Georgia is leaving real paths of destruction through the Midwest and southern states.Missouri, Kansas and Oklahoma I expect this in because I've always considered this tornado alley. Georgia and Alabama have had some really bad ones the last couple of years but I don't recall in the past that such weather was as prevalent there. Perhaps I've just never noticed it, but my thoughts and prayers the last two nights have been with those I know that live in those two states. Poem-A-Day is coming to an end. I confess I'm glad in a way. I generally write daily so that aspect is not a big deal... but I've been going to one source for prompts and sometimes I just get a little rebellious about prompts. I'm not a happy with the stuff I've written this month as compared to past years. I'm hopeful that May will bloom with lots of really good work! With the canonization of two Popes as Saints this past Sunday ( Pope John XXIII and John Paul II ) it suddenly reminded me that some years back on of my daughters gave a a St. David medal - the patron saint of writers and poets. 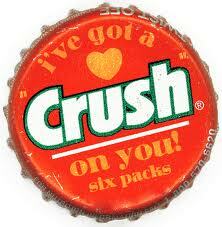 Funny that this just cropped back up in my mind. 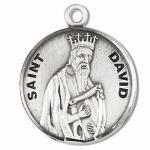 David is also the patron saint of Wales. Given the number of Welch poets I suppose this should not be a surprising coincidence. I confess that I'm always interested in patron saints. I suppose it's because I like a good story and they are always at the heart of a good one. Till next week - Stay safe and joyful! It's been one mowed lawn, one sick dog, several bags of pumpkin seeds, a first watermelon of the season and more snail mail sent out in one week then I've probably done in the whole past 6 months and an untold quantity of Diet Coke since my last confession. I don't know what has prompted the craving for pumpkin seeds but I confess you would be well advised to invest in them. I've eaten the at my desk at the office. I've munched on them while driving and they have become a staple during my writing. It's a wonder that I'm not writing Halloween themed poems. I suppose there are worse things I could be munching on. Still, I don't know how or why the craze has hit upon me but it has. Dachshund Barry has been doing really well lately. Last year he was withering away and we were concerned about him and had to have blood work done and after a series tests and observations be learned that he suffered from exocrine pancreatic insufficiency (EPI) a condition that basically leads to starvation without adding special enzymes cultures to his food. Barry went through a bought of diarrhea and vomiting. Not unlike the period of time he started his massive weight loss. Thankfully this was a very temporary thing and went away so we are back to normal. I confess that when this happened I had much anxiety fearing we were dealing something not temporary. It seems my worried were without reason. Seven weeks since I received my Poet Tarot Cards and I confess I've actually found them to be a positive tool for examining my work, my work habits, work attitudes, overall appreciation for artistic process. If you haven't acquired a set of them there are two or three days remaining to support the Kickstarter campaign of Two Sylvias Press and receive a deck. You can get the details here for receiving your own deck or just help support this worthy press. That's it for this week my friends. Wishing you all a great week! 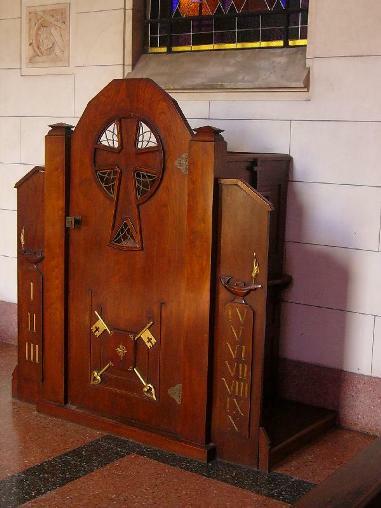 It's Tuesday and time for me to head to the confessional, there are several things on my mind today. 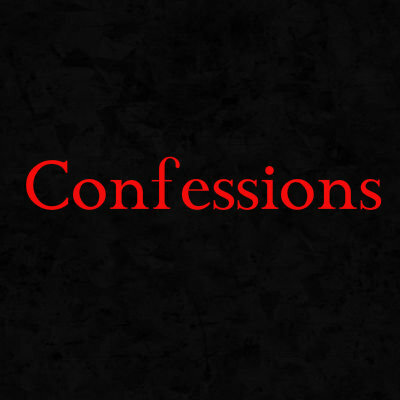 It's been two weeks since my past confession. Two very busy weeks at work and a battle to maintain sanity. Sometimes I think sanity is over rated. But let me get started with what I'm carrying on my chest. We are short handed at work. A coworker is out on medical leave and we've had to all chip in and absorb varying tasks that have to go on. We've been doing a good job but it is taxing and sometimes when I arrive home I haven't a lot of interest in anything but crashing. Some nights I succumbed to just crashing and doing TV. Still, I've rallied to take care of things on my writing to-do list but I'd feel better if I didn't have nights where I'm one extreme or the other... crash and burnt or wound up tight like a top spinning to catch up on everything. I confess I could do better with how I handle this time after regular work hours. In fact the past couple of weeks I've stopped working out on the tread mill. I confess that I know I need to keep this up to: 1. help control my blood sugar numbers 2. maintain weight control 3. cardio-vascular exercise 4. boost my overall energy level. So with all those benefits you'd think I'd be on it, right? And I started Sunday assessing of sorts what I need to be doing for my Creative Health. My resolve is to get up early in the morning and hit the tread mill before I head to the office. That's a responsible approach to take. I confess that I filed my taxes today... the last day. I've been so good about filing the early lately that this is an aberration. I actually did them Sunday and just reviewed them again tonight, no changes needed and then e-filed them. I'm not especially proud of myself for doing them at the last minute but I am proud of my wife for never once bugging me about them. Evidently she trusted that I'd get them taken care of. This week I began rethinking a manuscript that I was in wrap up stage on. I confess this is I think a good thing because I need to rethink a couple of things and there are two or maybe three poems that need to come out. I confess this is hard because at least one of them is a very good poem but it is not fitting into the thread I'm trying to weave between the poems. I confess I realize this is the prudent approach even if I want it to be otherwise. I'm learning that the heart and the head both have roles in this process. I've kept up with the poem-a-day challenge. I confess that I'm even surprising myself that I have not fallen off the wagon yet and we are halfway though. As we are in the final week of Lent I confess that it has been an objective of mine to try my best to practice tolerance daily. Overall, I'm happy that I've done well at meeting this challenge and I'm happy that I've made it a part of my Lenten practice. That's about it for tonight. Wishing everyone a great week ahead. 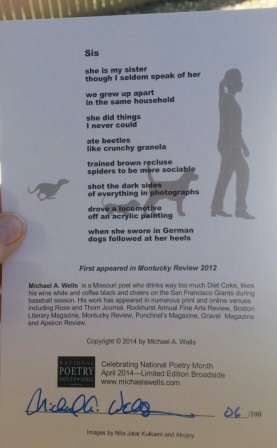 Some of you may have received a poetry month broadside from me in the past years to commemorate National Poetry Month. After taking a couple years break I have created a new one for 2014. These are limited. There are 100 signed copies. They are printed on a nice card stock and have a matte finish. I've seen some of my earlier ones framed and they look very nice. If you would like one simply email me Michael Wells telling me you would like one and give me a snail mail address that it can be sent to. Again their are only 100, and when they are gone, well, they are gone. It's The 5th Annual April Big Poet Give Away. 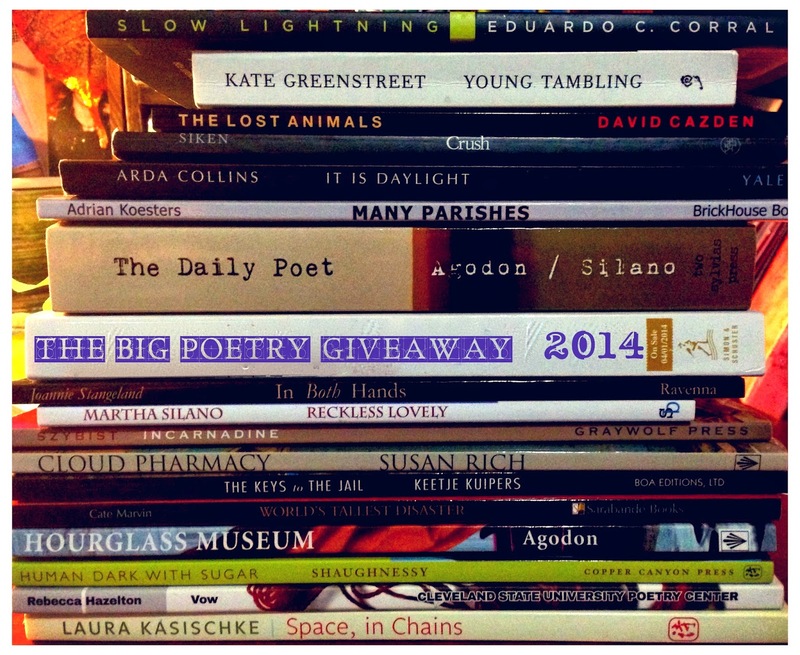 This year I've decided to participate as a "giver" in the Annual Poetry Month Big Poet Give Away. All you have to do is leave a post with your name in the comments below and you will be entered. This has to be done before Midnight (PST) April 30, 2014. At the conclusion of the month there will be two winners drawn at random. The lucky winners will me announced the week of May 1, 2014. Each will receive one book. Make sure you provide an e-mail address so that you can be contacted for mailing address if you are one of the winners. There are over 40 bloggers participating. Here you can find a complete listing of all the participating blogs. This annual event was started by poet Kelli Russell Agodon and continues to provide a way each April (National Poetry Month) to enrich the the lives of more people through poetry. I've selected books from two poets that are among my favorite. I hope that you will find their work as awesome as I have. by Mary Biddinger. "Mary Biddinger evokes the patron saint of female abuse victims in narrating the adolescence of a latter day Saint Monica. Ironic humor illuminates the poems as in 'Saint Monica Stays the Course,' a hilarious catechism of teeth-gritting endurance. Biddinger crisply narrates these memorable tales that entwine horror and sensual discovery, using deft rhythms, head-snapping line breaks, and highly original imagery." - Rachel Dacus, author of Femme au Chapeau and Earth Lessons. if you wish to be entered in in the drawing. My name is Michael Wells. I'm married and have 4 grown children. I'm in love with baseball and wish it were played year round. I think of the game as a form of poetry. My favorite team is the San Francisco Giants. I enjoy a good wine. My favorite Chardonnay. I like my wine white and my coffee black. I readily acknowledge I drink way too much Diet Coke. I do not have a published book but have a manuscript nearing completion. I have been published in a number of print and online venues. I have a number of varied artistic interests. While I have a full time job, I am serious about my writing and work it into my evenings and weekend writing daily. Wishing everyone an enjoyable month of poetry - and good luck! Leave your name & email in the comments below to be entered in the drawing. It's been one week of schizophrenic weather, a new baseball season, and several late night tread mill sessions since my last confessions. It's April first and I committed to the Poem-A-Day Challenge for poetry month. Who's the April Fool now? I confess that it has hit me the past two days that I have a lot going on presently with poetry and then along comes my beloved Giants and the start of the new season - all this is pulling at my evening time and causing some anxiety. Family time, poetry time, baseball, exercise, what's a guy to do? Perhaps this is accounting for my headaches of late... the anxiety I mean. I'm always looking it seems for things to link together. If this is happening it's in response to that. You get the picture. I have to confess that I'm not always exactly scientific about the process. I'm sure there is a name for people like this... crazy wasn't what I was thinking of but I guess we can use it temperately as one of those place holder words we writers use in drafts. The Poem-A-Day Challenge usually makes me anxious when I've done it on the past. Sometimes I say I'm not committing to it and end up trying to write a poem each day like I'm sneaking up on the Challenge and taking it on in some kind of sneak attack. It's crazy, I know. An there is that word again. 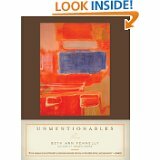 I confess my bug-a-boo with the 30 Poems in 30 Days thing is I'm not crazy about writing from forced prompts. I don't mind using prompts to kick-start ideas, I joust don't like to feel on day 7 I must writ about this prompt. I suppose it's a rebellious streak I have. In addition, I know that few people write "real" poems sitting down and writing in one day. What usually occurs is a draft. Most often a very rough draft. One you really don't care to attach you name to and post out in the open. Anyway, suffice to say that I feel laden with anxiety as we kick off the month. But hey, that leaves lots of room for an improved outlook!